Pack, organize, load and unload your cargo with ease. Fits all RoofBag car top carriers. Its hard to believe how much functionality these duffle bags add to the RoofBag car top carriers, until you use them. First, the duffle bags help you pack for your trip more efficiently: you can pack them individually in the house, and separate items among the three bags as you wish. Second, once packed, you can carry the duffle bags to the car and put them directly into the car top carrier. Without the duffle bags, you would have to load loose items one by one. Please note that the car top carrier should be filled on the roof, as it gets too heavy to lift if filled on the ground. Third, the 3 duffle bags nest nicely into the car top carrier, filling its volume optimally and helping preserve its aerodynamic shape (the rear is taller than the front). Fourth, the duffle bags help keep items separate during travel. To retrieve an item, open just one duffle bag, instead of having to go through the entire contents of the carrier. Fifth, unloading the car top carrier is much easier with the duffle bags. Whether its at the end of the trip, or at a hotel stop, just grab the bags and youre done unloading the carrier. Made of sturdy waterproof polyurethane-coated fabric, each duffle bag can hold up to 50 lbs of gear. A zipper runs the length of the bag and includes two sliders, for easy access to the contents from either end. Two heavy-duty handles make it easy to lift the loaded duffle bag. Fits all of RoofBag car top carrier models. Order the duffle bags according to the size of the RoofBag car top carrier: 11 cu. ft. or 15 cu. ft.
- Greatly simplifies organizing, packing, unpacking, and accessing your items. - Preserves the aerodynamic shape of the car top carrier, for fuel economy. - Eeach duffle bag holds up to 50 lbs of gear. - Genuine YKK zipper with two sliders for easy access from either end. - Two heavy-duty handles for easy lifting. - Available in two sizes: for 11 cu. ft. and 15 cu. ft. RoofBag car top carriers. - Fits all RoofBag car top carriers. - For 11 cu. ft. carrier: 37 long x 12 wide x 15 high at the rear and 8 high at the front. - For 15 cu. ft. carrier: 46 long x 12.5 wide x 18 high at the rear and 12 high at the front. Save Fuel with RoofBag top carrier's original aerodynamic design. • Save Cost when you buy factory-direct from RoofBag.com. RoofBag soft cartop carriers offer the capacity and efficiency of hard carriers, without their bulk, weight and high cost. RoofBag car top carriers are simple to install, remove and store. Use with or without a roof rack. Access your gear with ease. 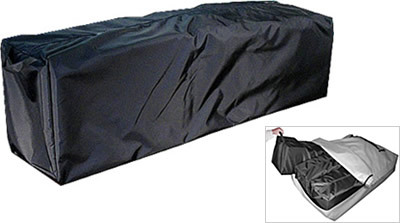 Heavy-duty, double vinyl-coated polyester fabric is fully waterproof, won't rip or tear and is UV-resistant. RoofBag car top carriers are manufactured in San Diego, California with US-quality, and sold world-wide exclusively through RoofBag.com. • Your online payment is secured with SSL encryption technology provided by VeriSign (Symantec) the most trusted name in web security. • We don't store your credit card information. Our rooftop carriers and accessories are always in stock and are shipped the same day you order (M-F before 3PM PST (UPS or Fedex), or before 10AM (USPS). Otherwise, next business day. Enter your Zip code in box above, and choose from several shipping options and arrival dates. You could have your cartop carrier tomorrow! • Our customer service is second to none, ready to assist you by phone, chat or email, before and after the purchase. • Live telephone customer support M-F 7:30AM to 4:00PM PST. • If you call outside these hours, your message will be returned the next business morning. Hundreds of customer reviews reflect the happy experiences of many thousands of satisfied customers.